Creel Cottage is a beautifully appointed, well equipped property in the former fishing and slate mining village of Balvicar. The cottage is situated around Balvicar Bay a well known sheltered yacht anchorage on the Isle of Seil and is connected to the mainland by crossing the famous 'Bridge over the Atlantic'. The Isle of Seil is only a short drive along the A816 from the busy tourist town of Oban, the Gateway to the Isles. Balvicar lies on the Isle of Seil, some 14 miles south of the major West Coast town of Oban. The whole area is one of natural beauty and is perfect for sailors and golfers – and for those who just enjoy peace and quiet. The island is easily accessible being connected to the mainland by the famous ‘Bridge over the Atlantic’. The bridge is approximately two miles from Balvicar at the village of Clachan where there is a pub called, The ‘Tigh an Truish’ (House of the Trousers) and a petrol station. Balvicar itself has a well-stocked licensed grocery shop and post office Balvicar Stores. The store also carries a wide range of fishing tackle, golf club hire and golf course day tickets. Two miles to the west is the conservation village of Ellenabeich where there are several small shops, The Slate Island Museum, a bar and restaurant, and the Seil Island Community Hall. 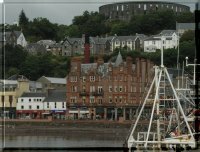 Further services are available in Oban, an expanding port with an attractive sea front and busy harbour, well known as the main Caledonian MacBrayne terminal and Gateway to the Isles. The town offers a full range of shopping facilities as well as banks and professional offices. See many more sights in the Creel Cottage Photographic Gallery.